Cultural and educational program kicks off new year – Cultural & Educational Center "LEADER"
A Morden program continues to offer an avenue for local children of immigrant families to learn in and nurture their language and cultural background. who serves as a Russian language teacher and tutor. Initiated in 2013, the program works with children ranging in age from three to 17. There are more than 50 children registered this year, with specifi c programs for different age groups and German courses also offered for all ages and abilities. “We place our students into the appropriate program based not only on age but also taking into account the language development of each child” said Vorobyeva. and customs. At the same time, they also want to broaden their worldview and help their overall development. 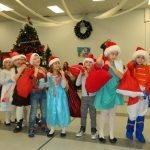 In addition to a variety of learning opportunities, the youth also participate in theatrical productions for special events both for parents and for cultural programs at various community events. The classes started up for another year Oct. 1 and will take place at École Morden Middle School every Saturday. More information is available through the Facebook page of Cultural & Educational Center Leader.